Ultrasound | Sutter Buttes Imaging Medical Group, Inc.
Ultrasound is a diagnostic exam that uses high frequency sound waves to produce real time images of the body. This is done by placing a transducer or wand-shape device against the area being examined. The high frequency sound waves produce echoes that are converted into electrical signals to create precise images of the body. Unlike x-ray, ultrasound does not use radiation; therefore it is considered a safe alternative for imaging pregnant women. Nothing to eat or drink 8 hours prior to your exam. Diabetic patients should attempt to obtain an early morning appointment. If you take medications in the morning, you may take them with a small sip of water or you can take them after your exam. Please avoid chewing gum or smoking before your exam. This action will introduce air into your stomach making it difficult to get accurate images of your abdominal organs. Please have nothing to eat or drink 8-hours prior to exam. Nothing to eat or drink 4-hours prior to your exam. Please take your medications as usual. Drink 32 ounces of water 1½ hours before your exam. You must drink all the water in 30 minutes. Do not empty your bladder. Your bladder must be full in order to perform an accurate exam. You will be asked to lie down on the examination table. The technologist will then apply a clear warm gel to the body part being examined. This gel will help eliminate any air being trapped between the skin and the transducer, thus producing a clearer picture. The technologist will then sweep the transducer back and forth to image the area of interest. Throughout the exam, you may be asked to move into a particular position or to hold your breath for short periods of time. In most cases for women having a pelvic ultrasound exam, additional imaging is performed using a special transducer to provide more detailed images of the interior of the uterus and the ovaries. 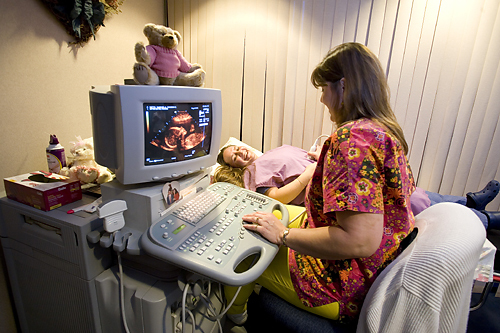 Usually, an ultrasound can take anywhere from 20-60 minutes depending on the type of exam you are having done.